The Animal Protection Act states, "Any animal placed in an animal shelter, which has not been returned to its owner and cannot be kept any longer or placed in a foster home, may be humanely killed after 60 days." (Article 57, paragraph 4). Animal Friends suggests the following alteration: "Any animal placed in an animal shelter, which has not been returned to its owner, remains in the shelter until it has been placed in a foster home." Explanation: The legal provision that allows animal killings in shelters after a certain number of days is not in the best interest of animal protection nor is it in line with the established practice of animal shelters in Croatia that do not kill animals and have positive abandoned animals rehoming results. Also, this is not in harmony with the citizens' will who do not want to see their money spent on animal killings, but on care, rehoming and education, which over a long term lead to good results in the interest of animals and people. It is unnecessary and counterproductive to specify a number of days for dogs to spend in shelters. It is equally important to give a chance to dogs who have been abandoned during the summer months (when people abandon the largest number of dogs, but rehome the least) as well as make sure all the necessary measures and those prescribed by law have been undertaken, such as vaccination, spaying/neutering, socialisation, advertising and in the end, rehoming. The most important fact for successful care and rehoming of dogs is that all shelters should be non-profit organizations, which will motivate the employees to uphold the law (animal advertising, prescribed vaccinations, spaying/neutering, veterinary care, education, involving the citizens, raising awareness regarding responsible treatment of animals...) and not to wait for the 15/30/60 day deadline so they can murder them. This is how the meaning of Animal Protection Act is achieved, which is to protect the animals and not to use regulations to ease and justify their murder. 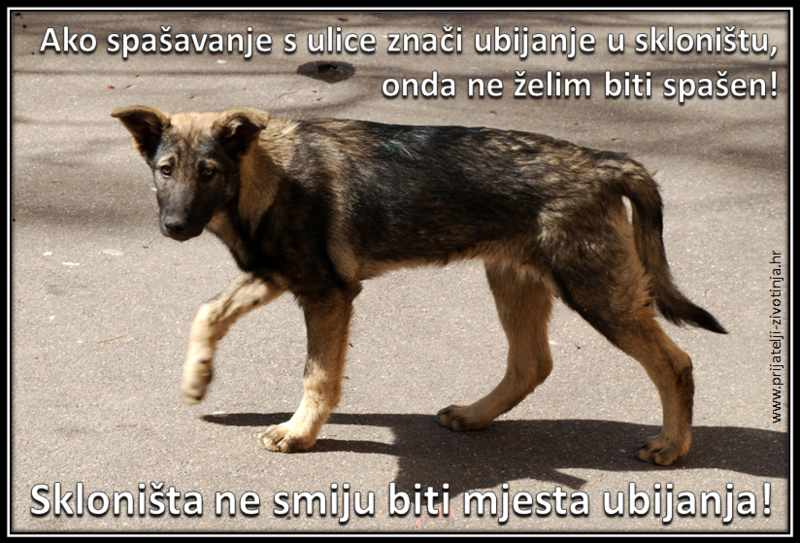 Practice shows that the most successful shelters in Croatia are those that do not murder animals. Non-profit shelters, which are within the institution or are run by associations make great efforts in animal care and show excellent results in implementation of the law, whilst profit making shelters that carry out killings have no incentive to make an effort regarding rehoming and education as well as proper animal care. One of the best examples where you can see how, among other things, taxpayers' money is misspent on animal killings, is the town of Osijek which finances the veterinary station Vetam with over a million kuna per year. The conditions in the shelter and behavior towards dogs are not satisfactory despite of the huge amount of investment. In the Vetam shelter in Beli Manastir in 2011 there were 191 dogs staying there, out of which 104 were killed and 87 adopted. Most of the rehoming happened as a result of volunteers from Osijek area' efforts or they were temporary housed by the volunteers, who later found permanent homes for them. Equally, the town of Osijek donated a hundred thousand kuna to the shelter in Nemetin, run by the Association Victories. With significantly lower funding and exceptional effort to adhere to the regulations of the Animal Protection Act and other provisions, the Association Victories has in 2011 saved over 200 dogs from the street and rehoused the same number, and not one dog was murdered. The shelter is attractive for visitors, foster carers receive a brochure with useful and educational information relating to care for their dog, at weekends people bring their kids over, there are workshops and numerous activities advertising and making fostering dogs popular, and they also collaborate with the Centre for Social Welfare. If the Animal Protection Act sanctions individual abuse and murdering of dogs, it should not allow in the provisions regarding murdering dogs in shelters, but show how to treat animals through shelters that do not kill animals. Furthermore, specifying a short deadline does not make animal rehoming possible, especially for the wounded and sick, who need more time for treatment and recovery, as well as older dogs. In addition to treating sick animals, it is essential for the regular operation of shelters to offer spaying/neutering, socialisation and re-socialisation respectively as well as animal advertising, which also requires certain time scales. Encouraging the implementation of the law can be achieved by prescribing penalty provisions for local self-governing units, as well as prescribing that shelters can only be run by non-profit organizations, such as associations and institutions. The proposal from Animal Friends for this change in the Animal Protection Act is from 2012, and it is an addition to the identical proposal that Animal Friends made in 2006 during the creation of the Animal Protection Act.